The ADS John R Turtle Diabetes Clinical Skills Training Course is designed to be practical and interactive. It will be run by experienced clinical endocrinologists from across Australia and will focus on everyday clinical skills required in the treatment of diabetes by endocrinology trainees. The course is supported by the Specialist Advisory Committee (SAC) in Endocrinology from the Royal Australasian College of Physicians (RACP). To honour Professor John R Turtle in his retirement, the ADS have resolved that the Course on an ongoing basis will be named The John R Turtle Diabetes Clinical Skills Training Course for Advanced Trainees in Endocrinology. The 17th ADS John R Turtle Diabetes Clinical Skills Training Course will be held on Friday 23 August 2019 from 1:30pm to 6:30pm following the ADS/ADEA Australasian Diabetes Congress at the International Convention Centre in Sydney, NSW. Please contact Linda Valenzisi at the ADS Secretariat via email at: linda@diabetessociety.com.au if you have any enquiries regarding the course. Registration for the course closes on Wednesday 31 July 2019 but early registration is encouraged as limited places are available. The ADS Secretariat will contact you in due course to confirm your registration. All trainees must also register for the ADS/ADEA Australasian Diabetes Congress in Adelaide to attend the ADS JRT Course. (Please note that you must also register for the ADS JRT Course via the ADS, independently from the ADC. Walk-up registrations on the day of the course will not be accepted). The Australian Diabetes Society gratefully acknowledges the generous support provided from Servier & Eli Lilly Australia for the ADS JRT Course. 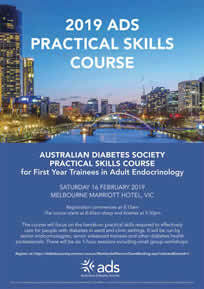 The Australian Diabetes Society is running its annual Practical Skills Course for First Year Trainees in Adult Endocrinology on Saturday 16 February 2019. The Course will be held at the Marriott Hotel in Melbourne. Registration commences at 8:15am. The course starts at 8:45am sharp and finishes at 5:30pm. The course will focus on the hands-on practical skills required to effectively care for people with diabetes in ward and clinic settings. It will be run by senior endocrinologists, senior advanced trainees and other diabetes health professionals. Supervisors are encouraged to advise incoming first year trainees of this course. Registration to the course is only open for First Year Advanced Trainees in Adult Endocrinology. Registration for the course is free of charge but trainees will need to organise their own travel arrangements (air travel and accommodation) to attend the course. Flights will need to be booked to allow FULL attendance at the course. Early registration is recommended as places are strictly limited. Please note that the course is being held on the same day as 'White Night' in Melbourne so it is highly recommended that accommodation is booked as early as possible. Please contact Ms Linda Valenzisi at the ADS Secretariat via email at: linda@diabetessociety.com.au for any enquires regarding the course. Cancellation: Please provide the ADS Secretariat notice by no later than Friday 1 February 2019 if you are unable to attend the course. This course is supported by funds provided to ADS under the National Diabetes Services Scheme (NDSS). The NDSS is an initiative of the Australian Government administered with the assistance of Diabetes Australia. We gratefully acknowledge the financial support for this educational activity. The 16th ADS John R Turtle Diabetes Clinical Skills Training Course will be held on Friday 24 August 2018 from 1:00pm to 5:30pm following the ADS/ADEA Australasian Diabetes Congress at the Adelaide Convention Centre in SA. Registration for the course closes on Tuesday 31 July 2018 but early registration is encouraged as limited places are available. The ADS Secretariat will contact you in due course to confirm your registration. All trainees must also register for the ADS/ADEA Australasian Diabetes Congress in Adelaide to attend the ADS JRT Course. (Please note that you must also register for the ADS JRT Course via the ADS, independently from the ASM. Walk-up registrations on the day of the course will not be accepted).